Long gone are the days when it was a challenge to find kid-friendly fun on a cruise ship. Nowadays, parents have the opposite problem: Being spoiled for choice in a sea of ever-more-amazing recreational activities, exciting kids clubs, family-sized cabins and youngster-focused bells and whistles. Whether it's your family's first or 21st cruise, you'll want to pick a sailing that keeps your whole crew happy. These cruises are guaranteed winners for seafaring families. Need a quick jolt of Vitamin D? Shorter (and thus affordable) cruises aboard the Disney Dream depart from Port Canaveral, Florida, to the Bahamas and include a day (or sometimes two) at Castaway Cay, Disney’s beautiful private island. Your cruise fare includes access to the island and youth areas, a barbecue lunch buffet, non-alcoholic beverages and self-serve ice cream. You can use their ship stateroom key cards to charge incidentals such as alcoholic beverages or rentals for bicycles, snorkel gear, or watercraft. The requirements to visit Cuba remain fairly strict, but cruise lines hold your hand through the paperwork. This four-night cruise from Miami on the Norwegian Sky makes stops in Havana and Stirrup Cay, Norwegian Cruise Line's private island in the Bahamas. You can sail to a galaxy not all that far, far away along with Darth Vader, Chewbacca, Storm Troopers and the intergalactic gang on special Star Wars-themed cruises. Disney Cruise Line is offering Star Wars Days at Sea, a day-long celebration aboard special sailings on the Disney Fantasy, whose many onboard attractions include the AquaDuck Water Coaster. Princess offers a seven-day Inside Passage cruise out of Seattle that makes stops in Ketchikan, Juneau, Skagway, and Glacier Bay National Park. Excursion options include flightseeing, dog sledding, whale watching, and much more. Plus, in partnership with the Glacier Bay National Park Rangers and the Discovery Channel, kids and teens can tap their adventurous side through the onboard Junior Ranger Program, panning for gold, and the "Deadliest Catch" Crab Sort Challenge. If your family motto is "go big or go home," consider a voyage on the world's largest cruise ship. Royal Caribbean's Harmony of the Seas sails out of Fort Lauderdale, Florida, offering weeklong cruises to the Eastern and Western Caribbean. The ship is packed to the brim with fun features, from waterslides and a dark ride called the Ultimate Abyss to a zip line, mini golf, and two surfing simulators. Dining options include restaurants from celebrity chefs like Jamie Oliver. Grab your swimsuit and your super hero cape. Disney Cruise Line offers Marvel Days at Sea, a special day-long celebration aboard select sailings on the Disney Magic, whose many onboard attractions include the AquaDunk water slide. Families can take part in numerous Marvel-themed activities during this special event, which is included in the Disney Cruise fare. Marvel Day at Sea is featured on itineraries sailing from New York City to the Bahamas in the fall of 2017. In addition, the event is featured on one sailing from New York City to Canada, also in the fall of 2017. Looking for a family cruise with exotic flavor? Norwegian Cruise Line's newest ship, Escape, sails out of Miami in early summer with weekly cruises to the Western Caribbean, stopping in Roatan (Honduras), Harvest Caye (Belize), and Costa Maya and Cozumel (Mexico). Anthem of the Seas sails from the New York area. It is the second ship in the Quantum class of ships, which introduced a number of “firsts at sea,” such as the RipCord by iFly skydiving experience, the North Star observation gondola, bumper cars, and virtual balconies. These shorter cruises offer plenty of time to enjoy all that the ship offers and a day to explore the pastel splendor of King's Wharf, Bermuda. Sailing from Vancouver, you'll explore Alaska's scenic Inside Passage and through the magnificent fjord of Tracy Arm, then call upon the historic mining and fishing towns of Skagway, Juneau and Ketchikan and enjoy two days at sea to take advantage of the many onboard amenities on the Disney Wonder. Disney Cruise Line also offers 5- and 9-night Alaska itineraries from Vancouver. 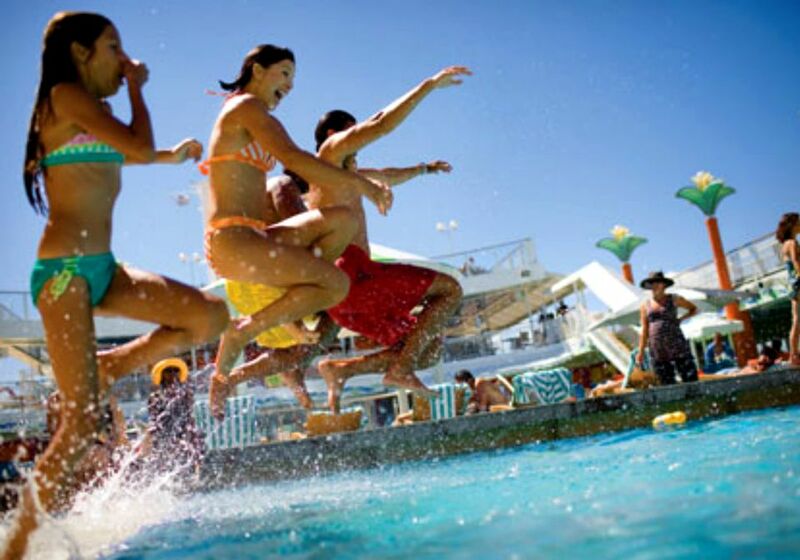 For affordability, you can't beat a short family cruise on Carnival's newest ship, Vista, which boasts the largest top-deck water park in Carnival's fleet and first-at-sea experiences such as SkyRide, a pedal-powered open-air aerial bike passengers can cycle around the 800-foot suspended track. There's also SkyCourse, a high-ropes course, and an indoor sports hangout with mini-bowling, ping-pong, arcade basketball, sports video gaming and more. The four-day Eastern Caribbean cruise makes a stop at Grand Turk, leaving plenty of time to enjoy the ship. This summer, Disney Cruise Line sails to the culturally-rich city of Amsterdam, Netherlands, for the very first time during the Disney Magic 15-night transatlantic crossing from Port Canaveral, Florida. Already in Europe? A visit to Amsterdam also will be a part of a 10-night European itinerary departing from Copenhagen, Denmark.